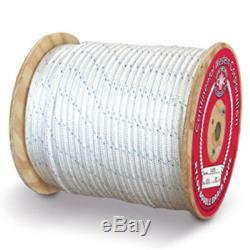 CWC Double Braid Nylon Rope - 7/16 x 600 ft. High strength and high stretch. Soft hand feel easy to splice. Highly resistant to rot and deterioration. Suited for towing and anchor lines. PRODUCT SPECS: LENGTH: 600 ft. TENSILE: 6313 lbs, WEIGHT: 31 lbs, PART #: 345045. Made from the highest quality UV stabilized yarns our premium double braided polyester rope is designed for general marine industrial and commercial usage. Nylon's high elongation properties and high-strength high-stretch and torque-free construction make it ideal in applications involving shock loads. Resistant to abrasions UV rays and many common chemicals. The item "CWC Double Braid Nylon Rope 7/16 x 600 ft, White" is in sale since Monday, October 2, 2017. This item is in the category "Sporting Goods\Outdoor Sports\Climbing & Caving\Ropes, Cords & Slings". The seller is "continentalwesterncorporation" and is located in California, US. This item can be shipped to United States.